(...) We get a more practical implementation of RFC 2822 if we omit the syntax using double quotes and square brackets. It will still match 99.99% of all email addresses in actual use today. A further change you could make is to allow any two-letter country code top level domain, and only specific generic top level domains. This regex filters dummy email addresses like asdf@adsf.adsf. You will need to update it as new top-level domains are added. So even when following official standards, there are still trade-offs to be made. Don't blindly copy regular expressions from online libraries or discussion forums. Always test them on your own data and with your own applications. There's something you have to understand the second you decide to use a regular expression to validate emails: It's probably not a good idea. Once you have come to terms with that, there are many implementations out there that can get you halfway there, this article sums them up nicely. In short, however, the only way to be absolutely, positively sure that what the user entered is in fact an email is to actually send an email and see what happens. Other than that it's all just guesses. HTML5 itself has email validation. If your browser supports HTML5 then you can use the following code. A valid e-mail address is a string that matches the email production of the following ABNF, the character set for which is Unicode. This requirement is a willful violation of RFC 5322, which defines a syntax for e-mail addresses that is simultaneously too strict (before the "@" character), too vague (after the "@" character), and too lax (allowing comments, whitespace characters, and quoted strings in manners unfamiliar to most users) to be of practical use here. It's clearly versatile and allows the all-important international characters, while still enforcing the basic anything@anything.anything format. It will block spaces which are technically allowed by RFC, but they are so rare that I'm happy to do this. I've put together an example in the fiddle http://jsfiddle.net/boldewyn/2b6d5/. Combined with feature detection and the bare-bones validation from Squirtle's Answer, it frees you from the regular expression massacre and does not bork on old browsers. This is the correct RFC822 version. A good practice is to validate your data on the client, but double-check the validation on the server. With this in mind, you can simply check whether a string looks like a valid email address on the client and perform the strict check on the server. lastAtPos < lastDotPos: Last @ should be before last . since @ cannot be part of server name (as far as I know). lastAtPos > 0: There should be something (the email username) before the last @. str.indexOf('@@') == -1: There should be no @@ in the address. Even if @ appears as the last character in email username, it has to be quoted so " would be between that @ and the last @ in the address. lastDotPos > 2: There should be at least three characters before the last dot, for example a@b.com. (str.length - lastDotPos) > 2: There should be enough characters after the last dot to form a two-character domain. I'm not sure if the brackets are necessary. Don't bother with anything more complicated. Even if you could perfectly determine whether an email is RFC-syntactically valid, that wouldn't tell you whether it belongs to the person who supplied it. That's what really matters. To test that, send a validation message. to pass the examples in Wikipedia Email Address. And you can see the result in here. Technically some emails can include quotes in the section before the @ symbol with escape characters inside the quotes (so your email user can be obnoxious and contain stuff like @ and "..." as long as it's written in quotes). NOBODY DOES THIS EVER! It's obsolete. But, it IS included in the true RFC 2822 standard, and omitted here. You should not use regular expressions to validate an input string to check if it's an email. It's too complicated and would not cover all the cases. You can refine it. For instance, 'aaa@' is valid. But overall you get the gist. And don't get carried away... A simple 90% solution is better than 100% solution that does not work. Simply check out if the entered email address is valid or not using HTML. There isn't any need to write a function for validation. It's hard to get an email validator 100% correct. The only real way to get it correct would be to send a test email to the account. That said, there are a few basic checks that can help make sure that you're getting something reasonable. Second, check to make sure that a period comes after the @ sign, and make sure that there are characters between the @s and periods. A solution that does not check the existence of the TLD is incomplete. 1- Validation of email format: Making sure if the email complies with the format and pattern of emails in RFC 5322 and if the TLD actually exists. A list of all valid TLDs can be found here. For example, although the address example@example.ccc will pass the regex, it is not a valid email, because ccc is not a top-level domain by IANA. 2- Making sure the email actually exists: For doing this, the only option is to send the users an email. Taken from http://fightingforalostcause.net/misc/2006/compare-email-regex.php on Oct 1 '10. But, of course, that's ignoring internationalization. 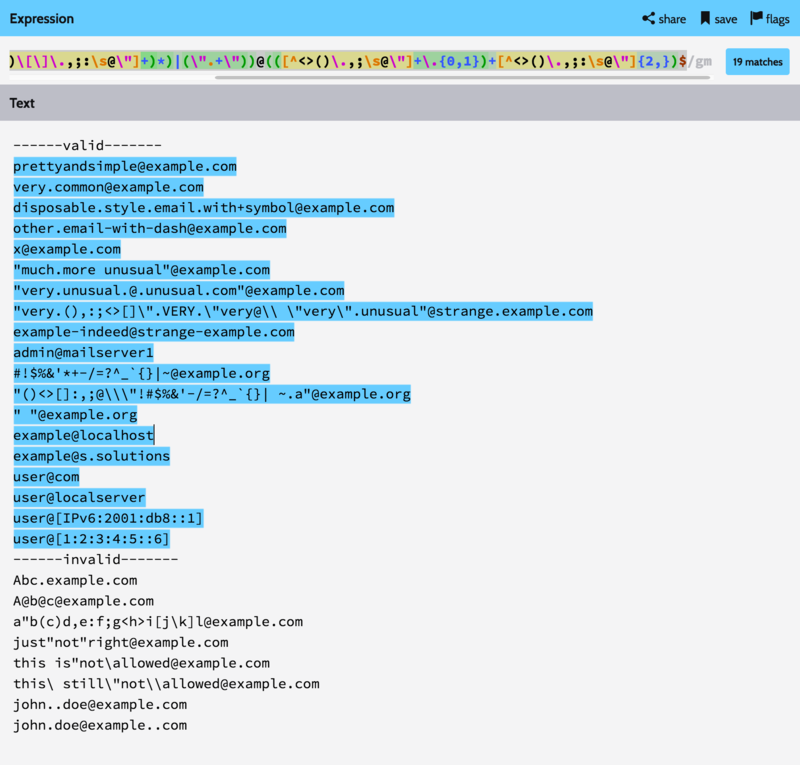 Here is a very good discussion about using regular expressions to validate email addresses; "Comparing E-mail Address Validating Regular Expressions"
My knowledge of regular expressions is not that good. That's why I check the general syntax with a simple regular expression first and check more specific options with other functions afterwards. This may not be not the best technical solution, but this way I'm way more flexible and faster. The most common errors I've come across are spaces (especially at the beginning and end) and occasionally a double dot. Which I post here in case it's flawed - though it's always been perfect for my needs. Forcing a text field to be a valid email?